The best part is coming home to a clean yard! Your customer service & quality is amazing! Hear Tulsa Poop 911 customers tell you why they're so happy! Have your pups left your yard hazardous and full of land mines? Your Poop 911 Team is Here to Help. Reclaim your yard with our pooper scooper service. Dog poop cleanup service is Poop 911’s specialty. POOP 911 can poop scoop your yard and remove toxic and unpleasant dog poop. We offer a large selection of other services to help you enjoy your yard with your family and pets alike. Poop 911 comes twice a week... They walk the entire yard and flower beds and remove all of the waste. I love this company… My yard looks great!!! I will definitely be recommending them to everyone I know in the future! We've used Tulsa Poop 911 for over 5 years now. The service is always perfect. Thanks for being a rock star at what you do. Worlds best customer service!! I love having this chore done for us. It is very little money well spent. Excellent service and the customer service is the best!... Highly recommend! When I called them just recently to use their service for the second time, Jon actually remembered me and started service the following week. Poop 911 is very professional and respectful to both my husband and I and our dogs. They come out every week weather it’s raining or not. The service is amazing… Scoop the poop… Easy! I have two black labs and a Chihuahua so we have a lot of poop. I LOVE not having to clean up after them. We can't say enough good things about Poop 911!... Awesome customer service, would definitely recommend to friends, neighbors and family. They do an awesome job!... They have great communication and complete the job every time. They showed up as scheduled even though it was raining. The guy did a great job and I'm very happy to be using their services. What a difference Tulsa Poop 911 makes to our yard. Dogs love it! We love it! An excellent service. Very reliable, courteous and thorough... I would recommend without hesitation. ...very professional, courteous, and do an amazing job of making our backyard look like we don't even have dogs! Such a great service, we wish we would have signed up sooner! Always comes on time and does a very thorough job… saves me, a dog lover, from doing this nasty job and leaves your yard POOP FREE!!! Would highly recommend this service. Very friendly. We are really happy (...) They do a great job & our 3-year old can play in the backyard regularly. The best part of the month is coming home to a clean yard! (...) your customer service & quality of service is amazing! Thanks, man! You are the best $10 I spend every week! We've been using Poop 911 for quite a while and have had great service from all the scoopers! Worth every penny! Poop 911 does a great job. [...] Well worth our money! Would highly recommend them! [...]They are so quiet, I usually don't even know they are in the back yard. [...] I have had to make some unusual requests due to unexpected twists in my life and they have helped me out every time. You and your crew rock. Poop 911 did a fantastic job! [...] Areas that were dying came back to life, everything was greener. It has been worth every penny to invest in this service. I can't think of another service provider who has given me better customer service. I highly recommend this company without reservation. 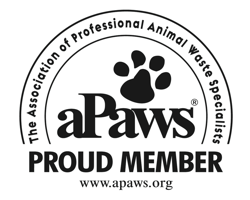 If you are looking for a dog waste cleaning service, look no further.. this is the one! During the transition they were very professional and that professionalism has remained consistent with their service. They do a great job and I would highly recommend them! Had an incredible experience with Chelby, one of Poop 911's employees, that really defined the kind of service I get from Poop 911... Highly, highly recommend! Jon Wood is wonderful to do business with. He's not only professional about his business, but he appears to truly care about his customers and if the work is being done to their satisfaction. Great service. Always reliable and prompt. Does not require much logistic on my part. Easy payment. I appreciate your work. Definitely recommend to others that don't have time or want to do a dirty job. Having Poop 911 is not only a luxury but a necessity -- with 3 dogs. Would highly recommend them to anyone who does not like scooping the poop (that would be everyone with a dog(s)). You have provided impeccable customer service and I will recommend you and Poop911 very highly to everyone. You provide a great service and you have a wonderful attitude towards business and life. Jon and Co are very professional, prompt, and easy to work with. His team always arrived as promised and did a thorough job of cleaning my yard. I would use them again! They did a very nice job. I would use them in the future. They did a very good job. I have no complaints. They come and do their job and I normally do not know they are here. I would recommend them and I am continuing to use them. They were very responsive when a date needed to be changed for service. Searched on line and found local references. So happy with the service. They treat my pets very well!!! Great service, great price! They are very professional! I would recommend their services to anyone. Poop 911 does the dirty work so we don't have to! They are always nice to our dogs and lock our gate behind them. I would recommend them highly. Jon really knows the scoop, which he uses to pick up the poop. His work is really picking up as well as piling up! So hire John to get that crap off your lawn. We have used his service for over two years and would recommend Jon to anyone. Poop 911 is one of the few services I've dealt with that has actually delivered above and beyond my expectations. I wish all of my service providers were this customer focused! OKC Poop 911 is an excellent service. I have been with them a year and they are very timely and communicate if they are going to change the day they come. No problems! Highly recommended. Jon is personable, punctual and very reasonable on price. He also looks out for our dogs and home and advises me of any concerns at once. We are thrilled with his services! Very professional and personable business owner. Would definitely recommend his service to others. Jon and his staff are very professional and committed to customer service! They are consistent and do a quality job! Thanks for your excellence! Jon and his team are very professional and experts at making sure your lawns are clean, safe, and healthy for you, your family, and your pets. His prices are great, and Poop911 is extremely dependable. When was the last time you were able to play with your pups or host a cookout in the backyard, without fear of what was stepped in? Poop 911 will clean your yard so you can spend your time on more important things - like loving your pups and playing with your kids. When you show potential tenants around your community do you have to walk a "certain direction" in order to avoid problem areas? What happens when that prospect (potential client?) steps off the path and drags something smelly back into the leasing office? Call Poop 911 and we'll show you how your community can be safe and clean for your tenants and visitors.